2016 Out for the season. Tower Marine pulled Kraken for me mid-September this year and it has been raining ever since. 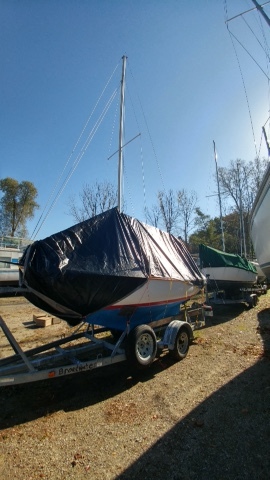 Sunday after it stopped raining I got down and pulled all the sails and cushions for the winter. I have to get down and do a little more cleaning and pull the motor this weekend. I'm hoping to get the cabin squeaky clean so when spring rolls around I'm ready for a early launch again this year. 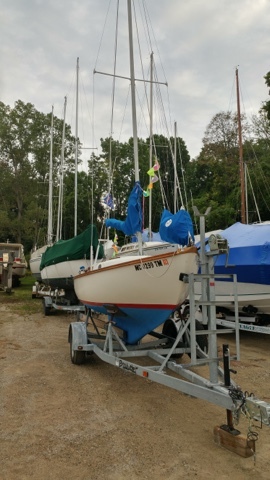 This year I'm planning on leaving the mast up and tarping off over the boom and spinnaker pole hopefully giving my self a bit more pitch so the snow slides off as they are predicting a rough winter for us. It all fits in the back of a Ford focus. Sun setting on the end of a great season. Drying stuff out in the garage. A quick end of season cleaning before stashing the cushions under the guest bead for the winter helps. It is amazing the condition of these cushions after 38 years they still look new with a little Armor All.